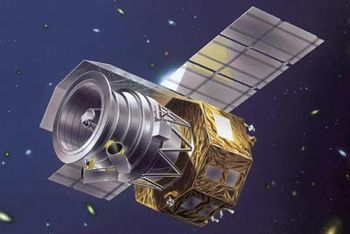 NASA Small Explorer program; the IRIS Interface Region Imaging Spectrograph was designed to obtain high resolution (0.3 arcseconds) high cadence (1 second intervals) imaging and spectra of the sun with its 20-cm telescope, in two far-UV bands (1332-1358A, 1380-1406A) and one near-UV band (2785-2835A). Air dropped in Point Mugu Drop Zone. Particle imaging satellite built by Lockheed Martin Space Systems Advanced Technology Center (ATC) for NASA, USA. Launched 2013. AKA: IRIS. Status: Operational 2013. First Launch: 2013-06-28. Last Launch: 2013-06-28. Number: 1 . Gross mass: 200 kg (440 lb). Apogee: 663 km (411 mi). The Interface Region Imaging Spectrograph (IRIS) is a NASA Small Explorer class solar mission. It was launched from a Pegasus XL flying out of Vandenberg AFB in California. The rocket was deployed from an Orbital L-1101 carrier aircraft flying over the Pacific Ocean at an altitude of 39,000 feet (about 12 km), roughly 100 miles northwest of Vandenberg. The rocket was dropped at 7:27 p.m. PDT on 27 June 2013 (02:27 UT, 28 June). IRIS is intended to advance Sun-Earth connection studies by tracing the flow of energy and plasma into the corona and heliosphere for which no suitable observations exist. To achieve this IRIS will obtain high-resolution UV spectra and images of the sun's chromosphere, specifically on the non-thermal energy that creates the corona and the solar wind. IRIS seeks to determine: (1) the types of non-thermal energy which dominate in the chromosphere and beyond; (2) the means by which the chromosphere regulates mass and energy supply to the corona and heliosphere; and, (3) how magnetic flux and matter rise through the lower solar atmosphere, and the role played by flux emergence in flares and mass ejections. To answer these questions, IRIS will utilize a single intrument, a multi-channel imaging spectrograph. See the experiment description for details on the IRIS instrument. More at: IRIS Interface Region Imaging Spectrograph. Family: Astronomy. Country: USA. Launch Vehicles: Pegasus, Pegasus XL. 2013 June 28 - . 02:27 GMT - . Launch Site: Vandenberg. Launch Platform: L-1011. LV Family: Pegasus. Launch Vehicle: Pegasus XL. IRIS - . Mass: 200 kg (440 lb). Nation: USA. Class: Astronomy. Type: Solar satellite. Spacecraft: IRIS Interface Region Imaging Spectrograph. USAF Sat Cat: 39197 . COSPAR: 2013-033A. Apogee: 663 km (411 mi). Perigee: 622 km (386 mi). Inclination: 97.90 deg. Period: 97.56 min. NASA Small Explorer program; the IRIS Interface Region Imaging Spectrograph was designed to obtain high resolution (0.3 arcseconds) high cadence (1 second intervals) imaging and spectra of the sun with its 20-cm telescope, in two far-UV bands (1332-1358A, 1380-1406A) and one near-UV band (2785-2835A). Air dropped in Point Mugu Drop Zone.